Wandering about the seaside town of Swampscott on the North Shore on a beautiful summer afternoon recently, we happened upon the charming Maison de Mer shop a stones throw from the ocean! 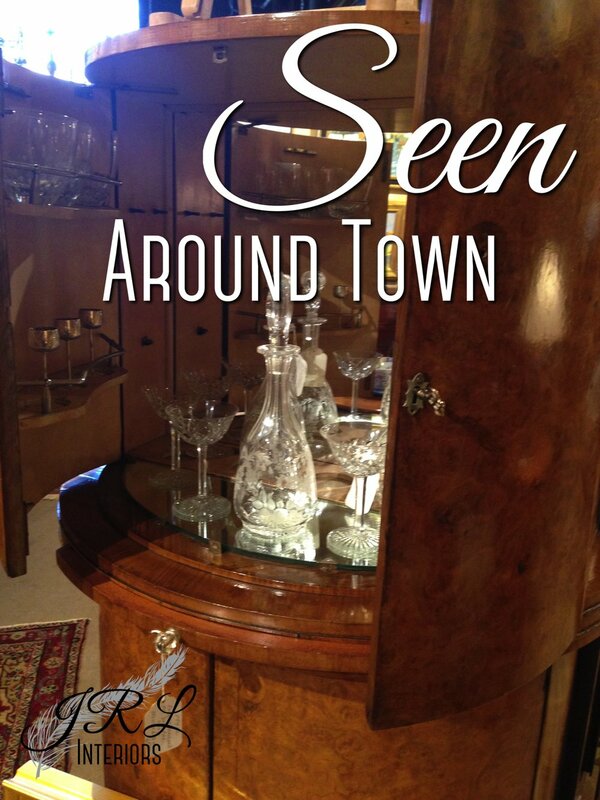 Vintage and new tableware, furnishings and accent pieces are interspersed with imported French lotions, creams, and soaps. Alongside a few Swampscott stamped tote bags and pillows are a smattering of miscellaneous other treats from French-themed books, to paper goods and baby bibs . In the world of design, I am in favor of a mix of leggy and skirted pieces in any room. 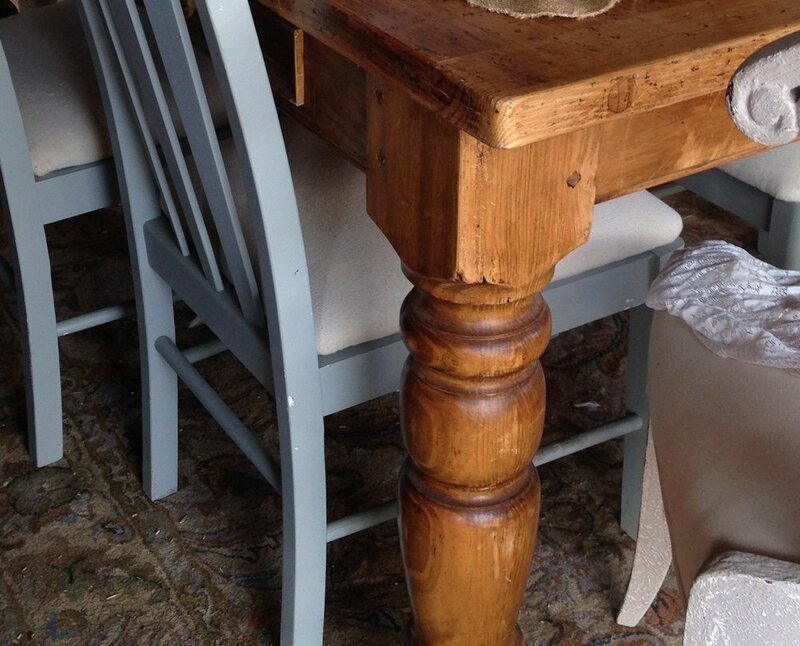 Legs give pieces a lighter, less bulky feel. 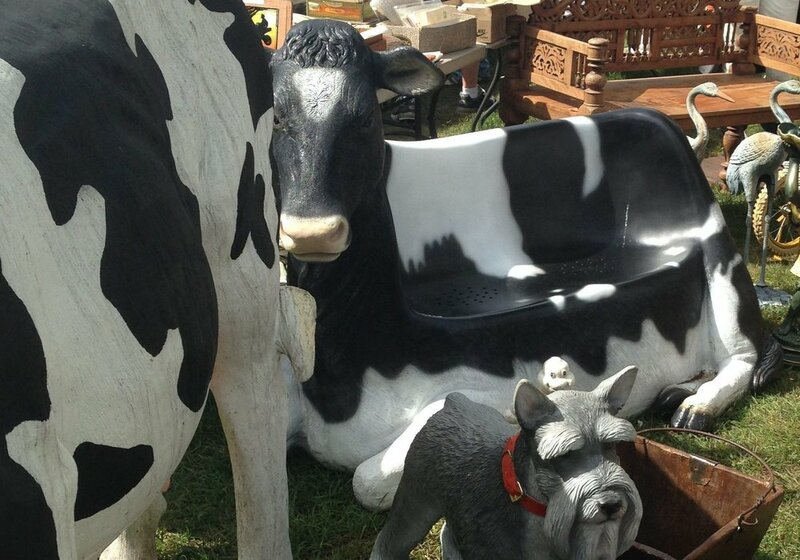 That said, the choice of styles available is vast! 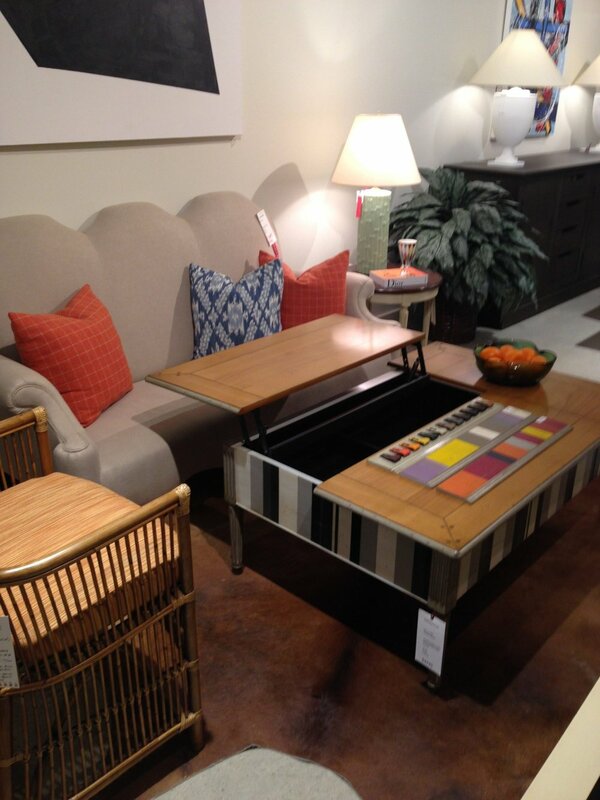 So, without further ado, here is a round up of some of the options spotted recently at the Boston Design Center. FINALLY! 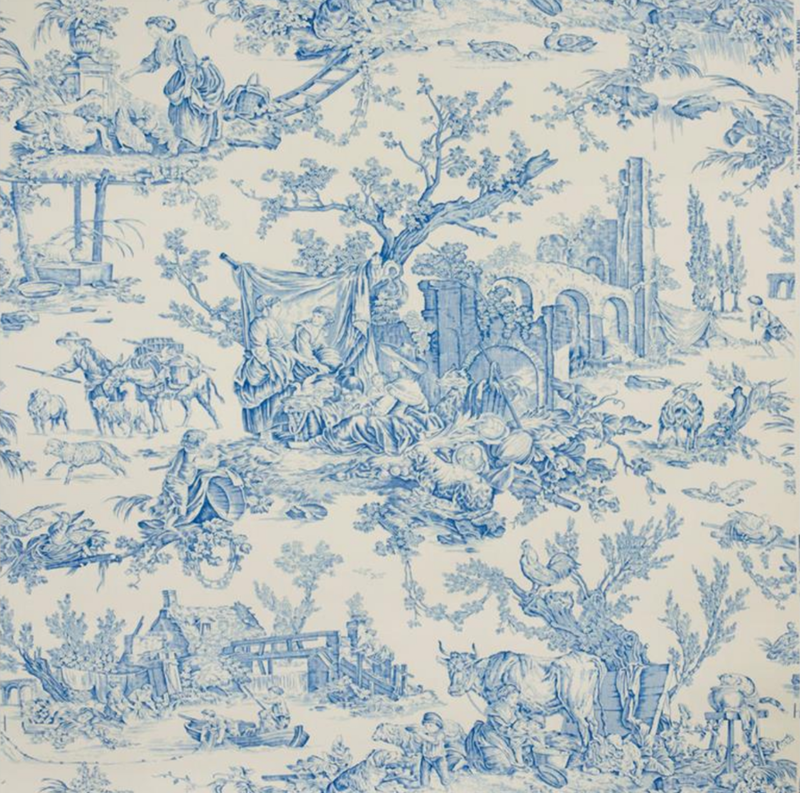 After years of poring over the Ballard Designs catalog and absorbing the pretty vignettes, the catalog has come to life right here in New England! A new Ballard Designs retail store has opened at the Natick Mall. It is a breath of fresh design air after years of proliferating Pottery Barn and Restoration Hardware stores. 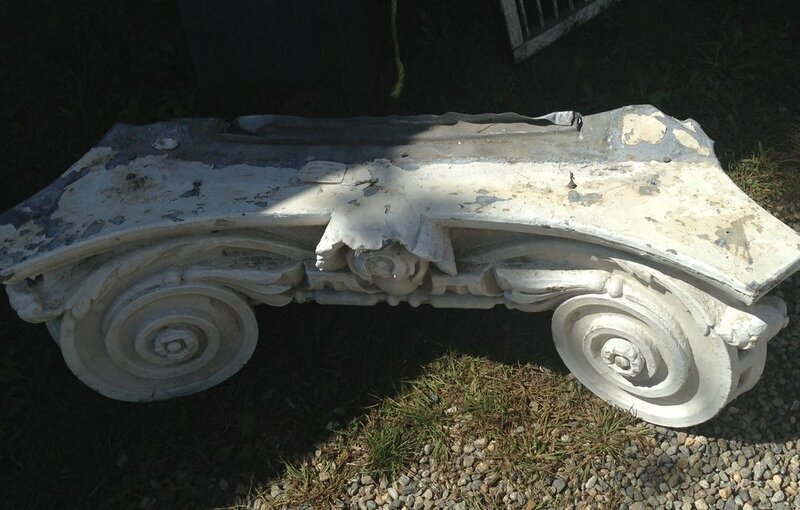 While the quality level and prices are all similar, the ingredients are a bit more classical than Pottery Barn and a bit more varied than Restoration Hardware. 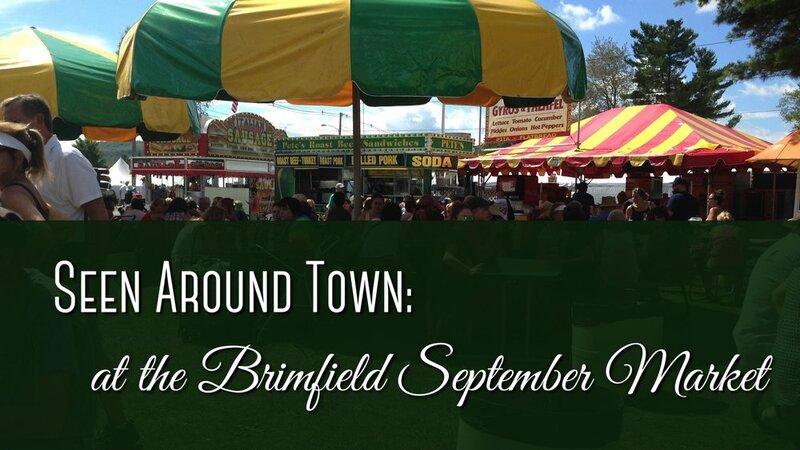 I love going to Brimfield, and the fried dough is not the only reason! 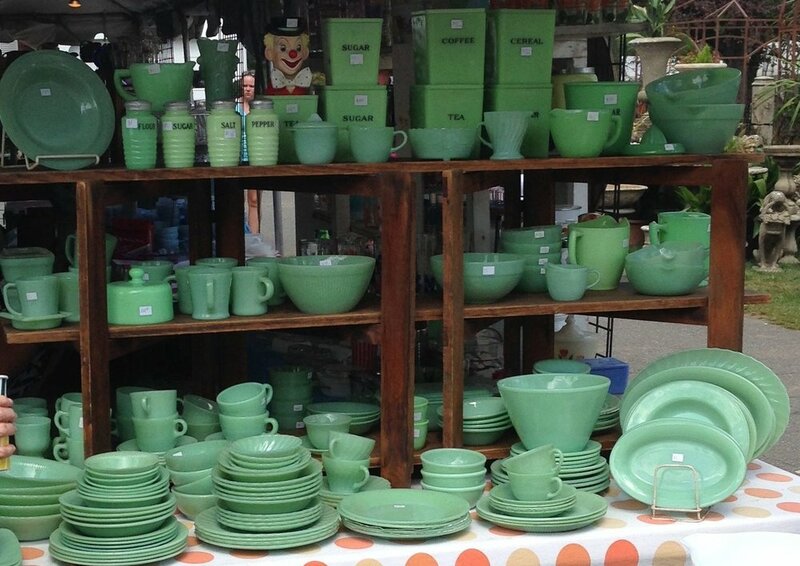 The HUGE Massachusetts outdoor antique and flea market takes place three times each year and September is usually my favorite one. This year, we managed to go on a 90-plus degree day with humidity somewhere in the stratosphere so it was less crowded than usual. 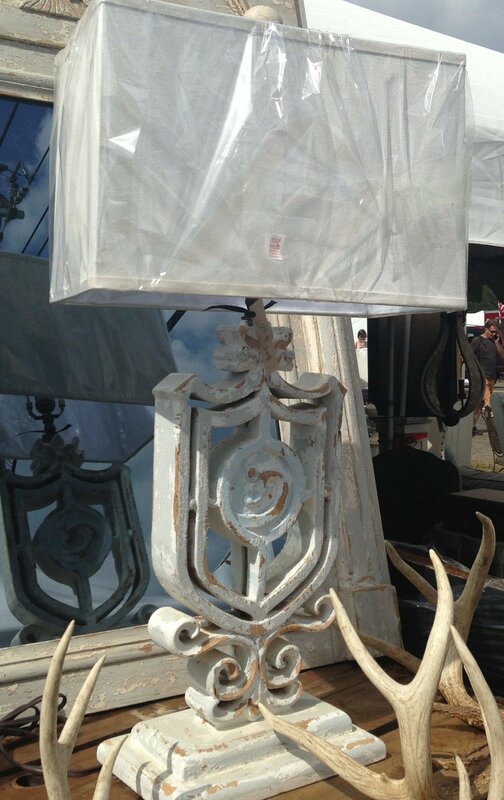 This vendor had a terrific assortment of marine salvage with a LOT of light fixtures. 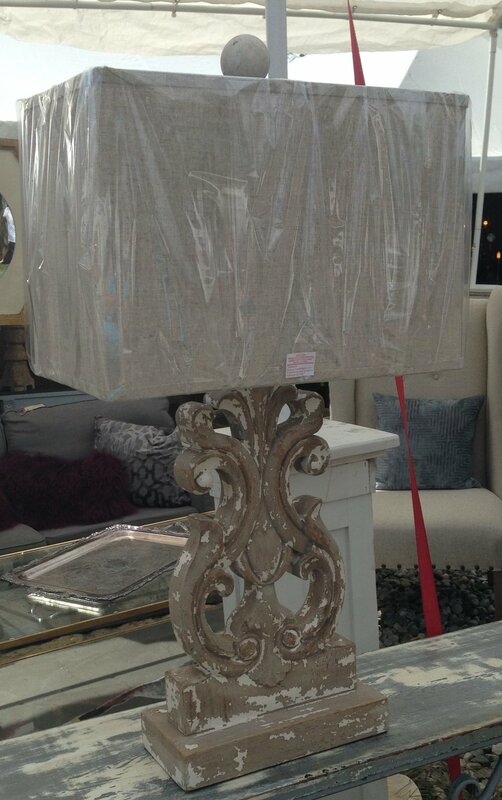 We thought some of these pendants would be fabulous over a kitchen island! 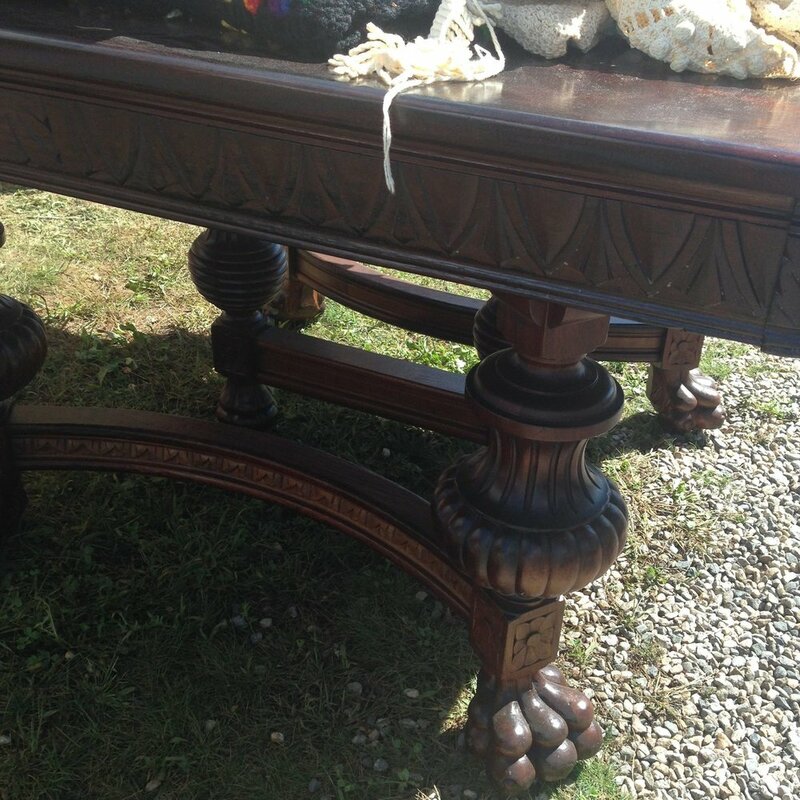 If you are in the market for unusual tables, there were a fair number of options to be had. 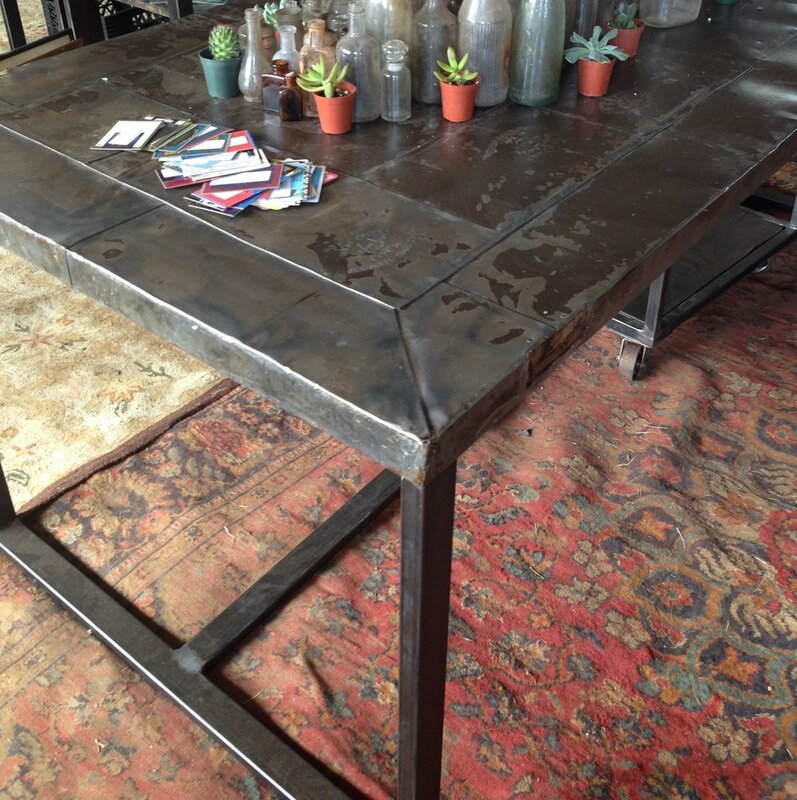 And then there was this really unique metal table made from a vintage metal door - it even still has the keyhole! 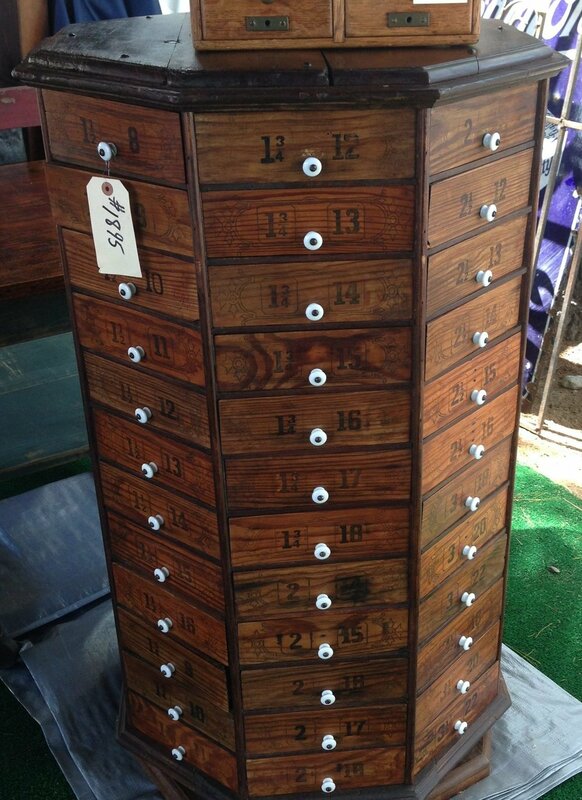 This one has 124 drawers! 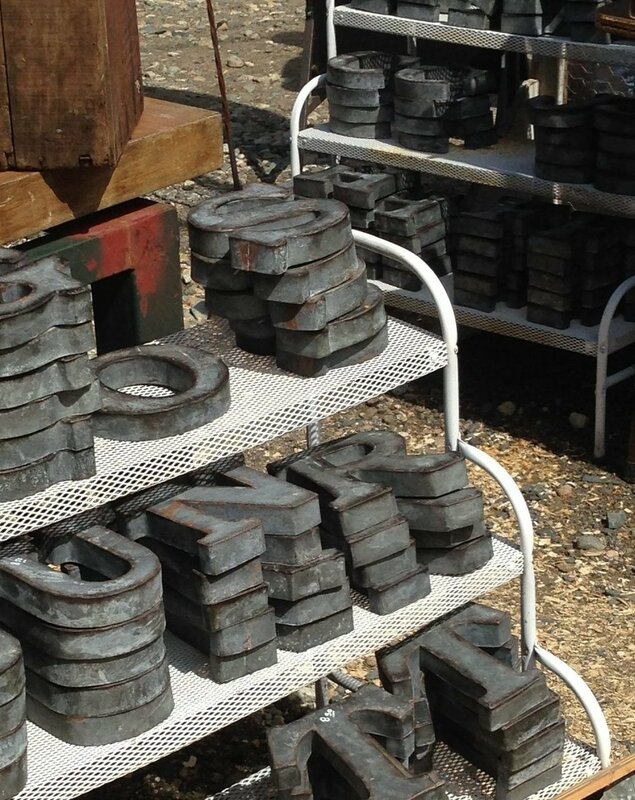 Vintage signs, architectural salvage - some of which was upcycled into other things like mirrors, and painted furniture abounded...you could even buy the paint - both Annie Sloan Chalk Paint and Milk Paint displays were seen. 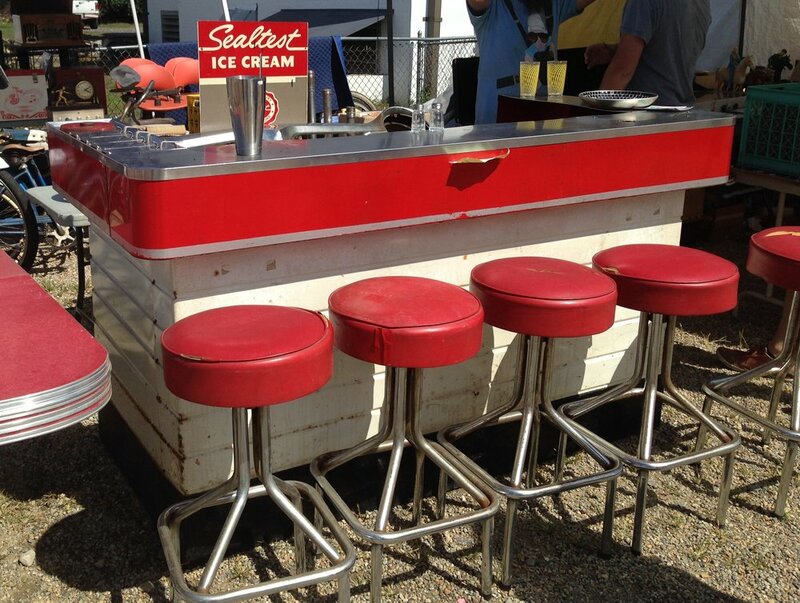 If you have just the place for it...maybe a fun pool cabana house...this vintage ice cream fountain out of an old store in southern Massachusetts would be SO fun! 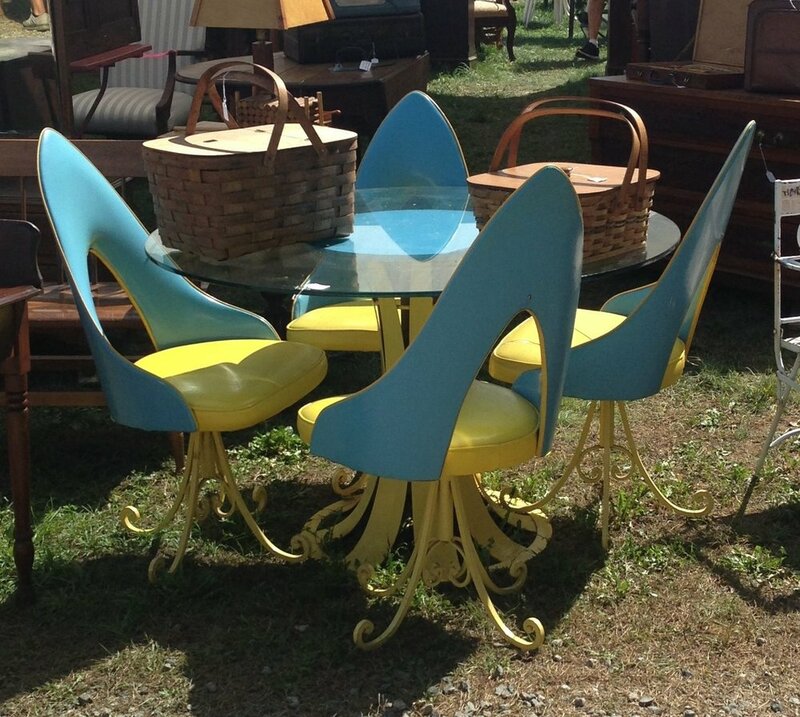 And finally, a couple of seats in the category of "WHY?" ...or maybe "WOW." I guess there really IS something for everyone! 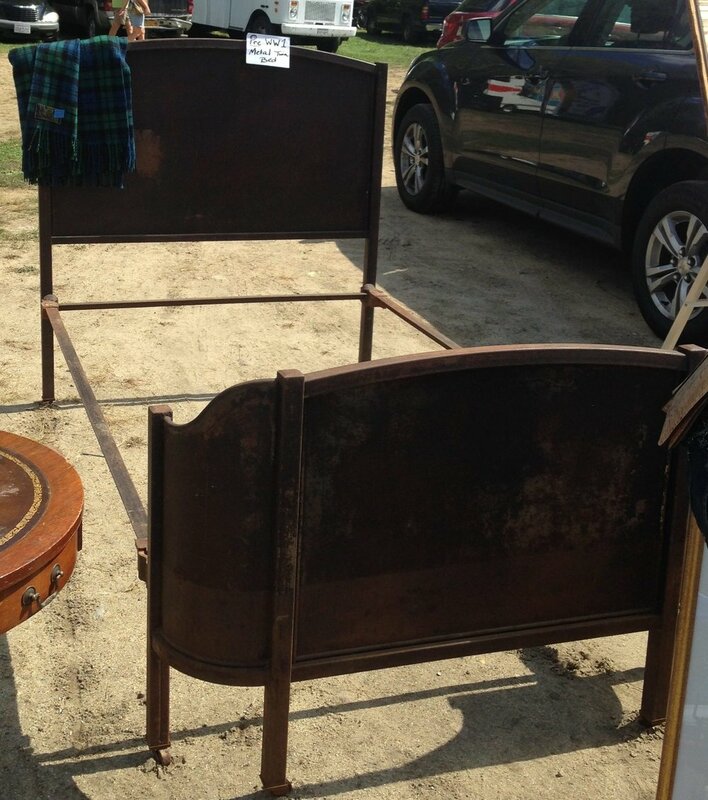 Brimfield. Always entertaining, one way or another! The unique fabric above features squares of appliqued velvet scattered like shimmering confetti, while the ones shown below show some embroidered geometric patterns. 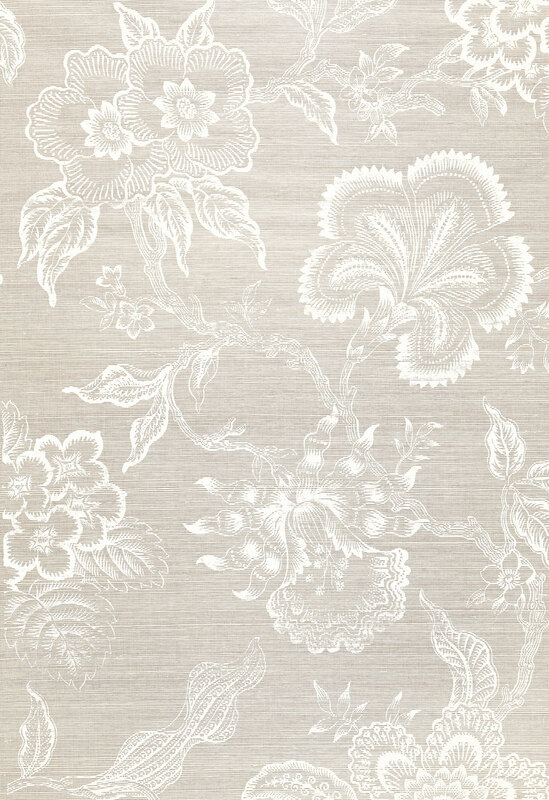 This gorgeous grey toned embroidered Jacobean floral quietly embodies elegance. 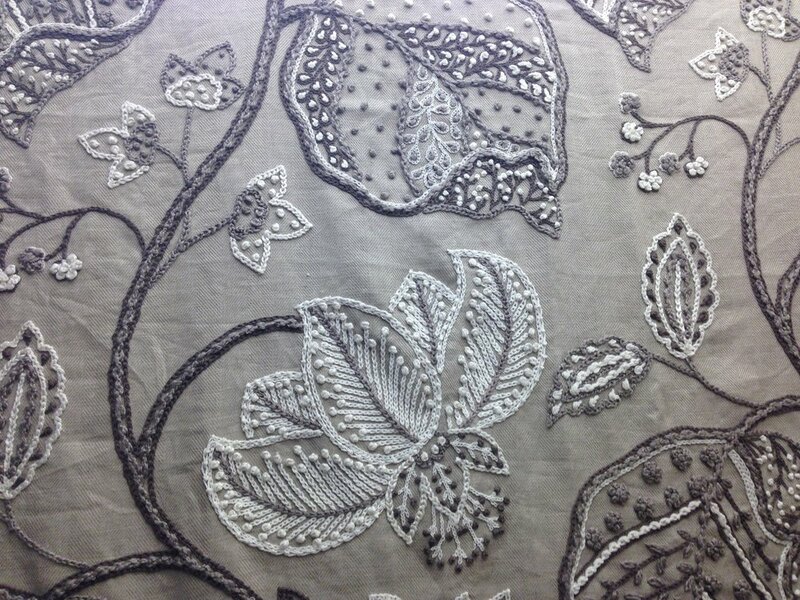 Embroidery on black linen is rich and dramatic. 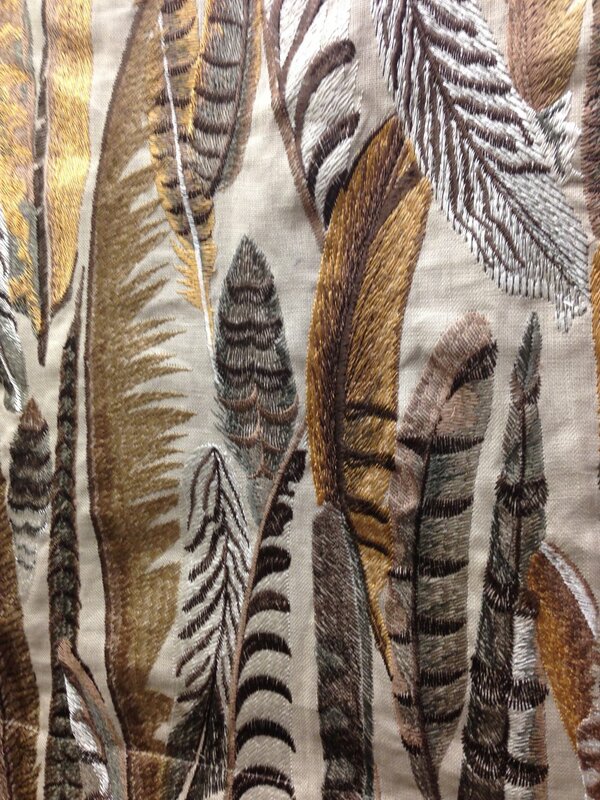 Fun thematic embroidered fabrics like these feathers or sea fans can enliven a whole room. 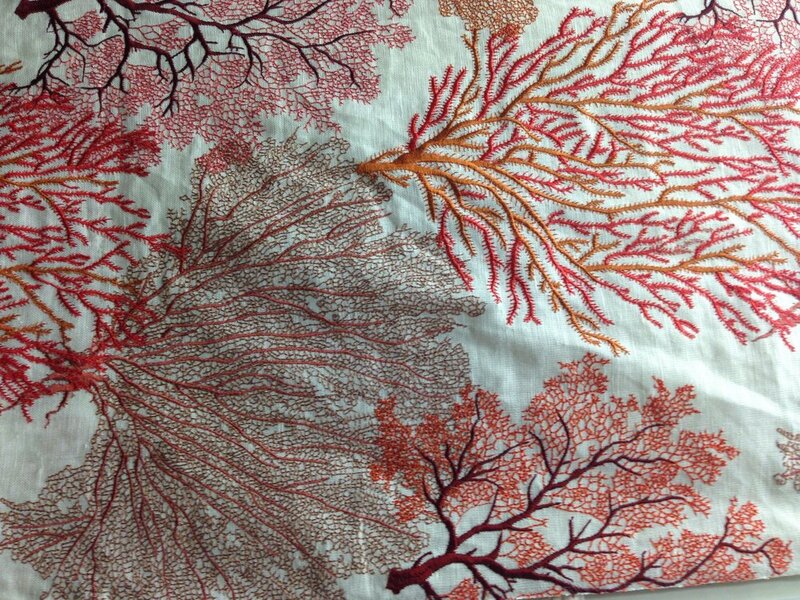 This pretty embroidered branch pattern comes in several colorways. 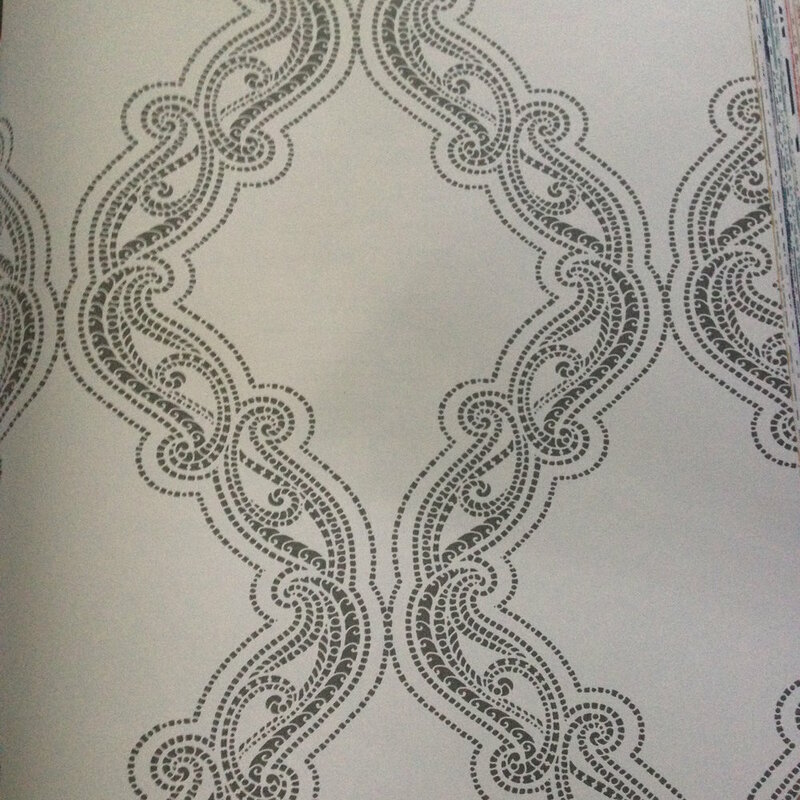 Soutache trim creates a stunning geometric pattern and a dramatic texture. This soutache applique has a whimsical feel. 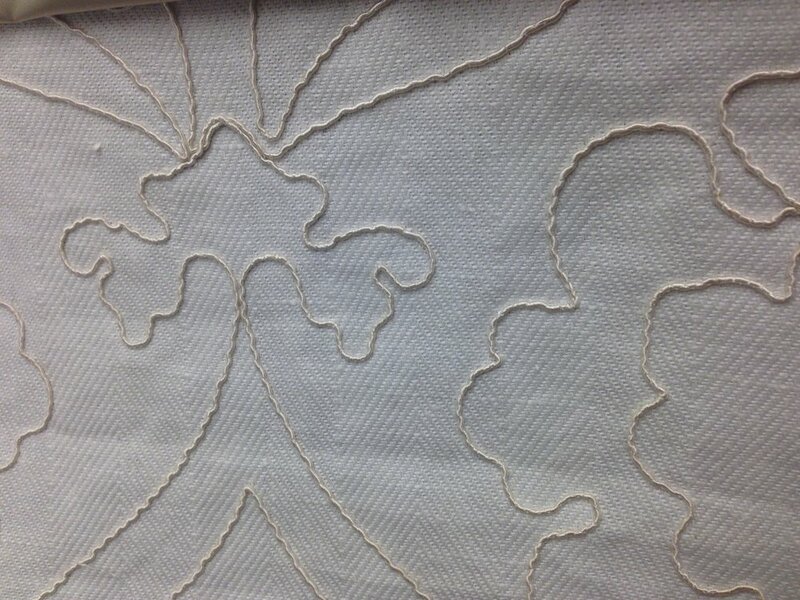 And this embroidered 'damask' pattern on a herringbone base cloth is an elegant contemporary take on a traditional pattern motif. 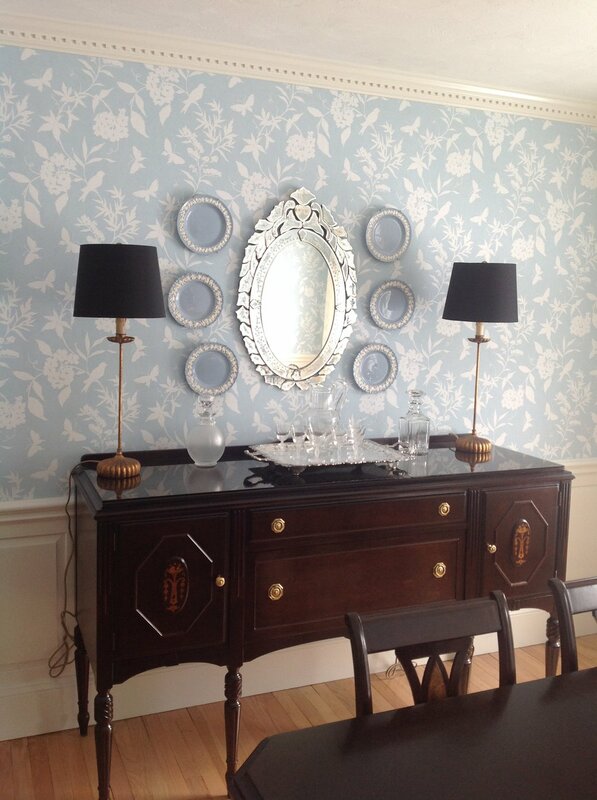 Textured fabrics add so much personality and elegance to a room in any style of decorating. Need help choosing exactly the right combination for your space? We would be happy to assist! 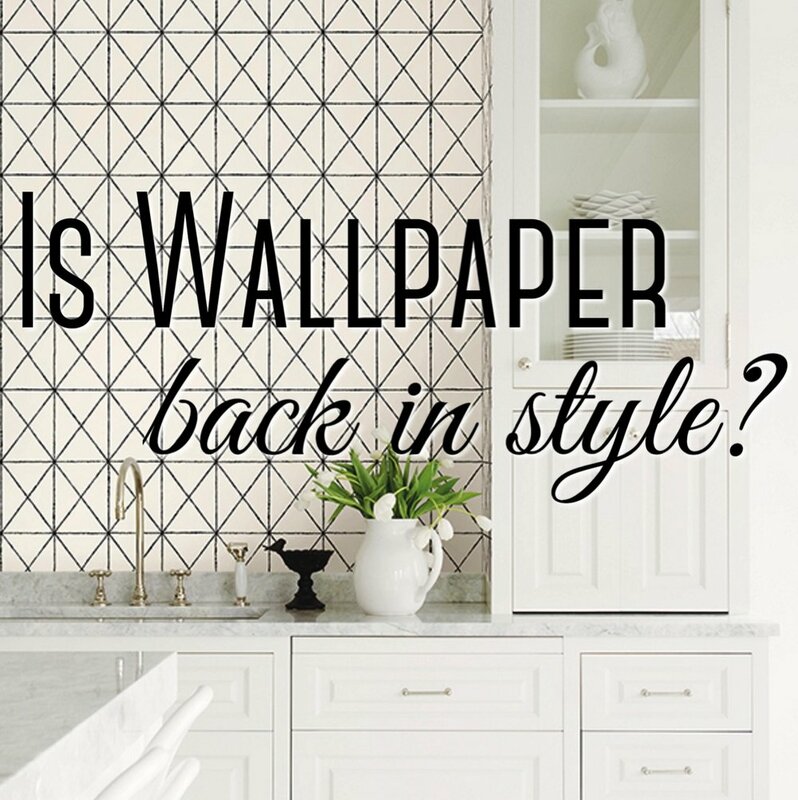 Is wallpaper making a comeback? I would argue a resounding yes. I know, I know, I can HEAR you rolling your eyes … I too have spent agonizing days with a steamer and a scraper removing old ‘cute’ floral stripes from endless bedroom walls with no wish to repeat this torturous exercise. Ever. 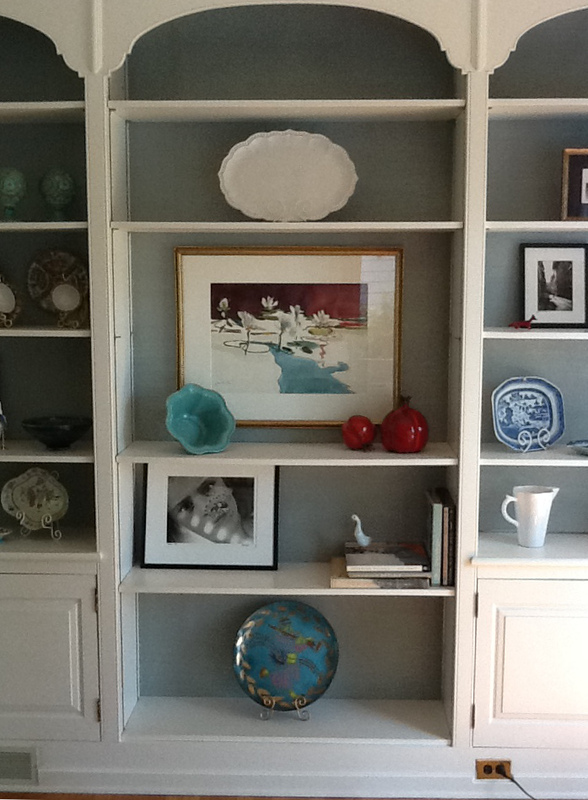 Until fairly recently, there has been a definite push toward paint for walls. Oh, the occasional special paint finish appeared…some finishes exquisite, like a beautiful combed strie, or a Venetian plaster, and some, not so much … we’re looking at you, sponge painting … which the do-it-yourself crowd embraced, often with the enthusiasm and skill of a 4 year old. 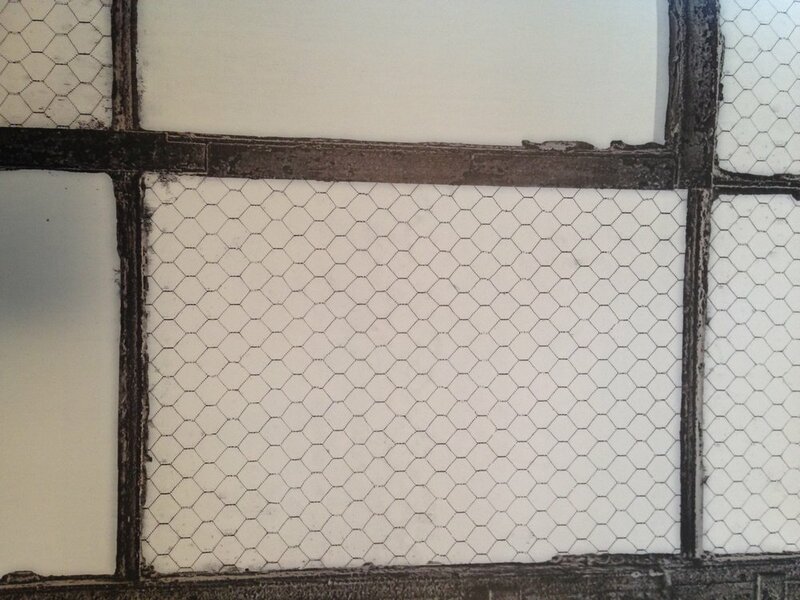 And let’s not forget stenciling - okay yes, maybe we should try to forget that. But even decorative paint finishes gave way to clean smooth painted walls in the recent decade. 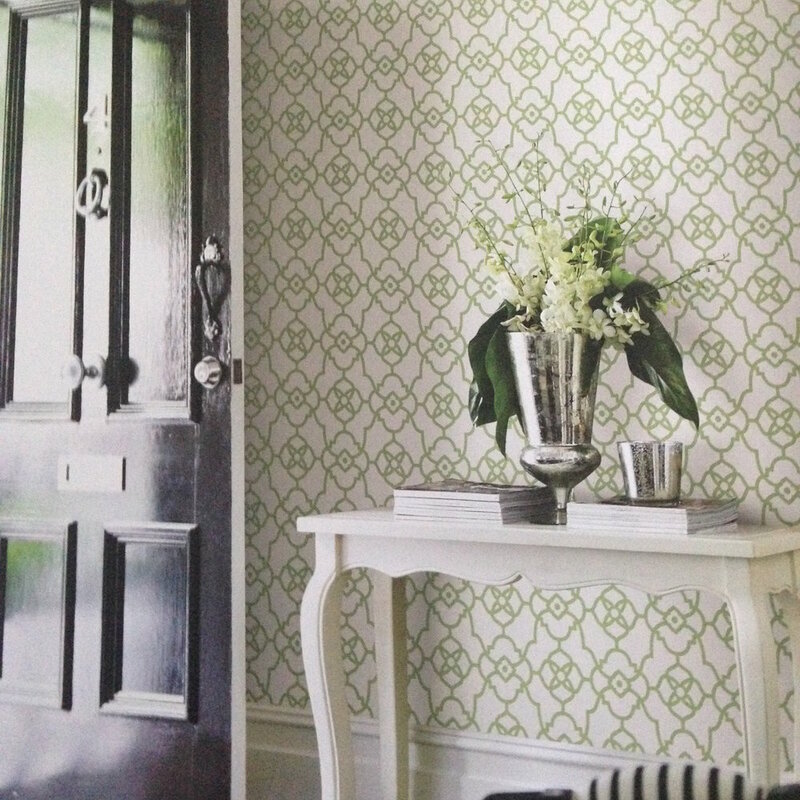 But are plain walls and simple lines starting to look ubiquitous? 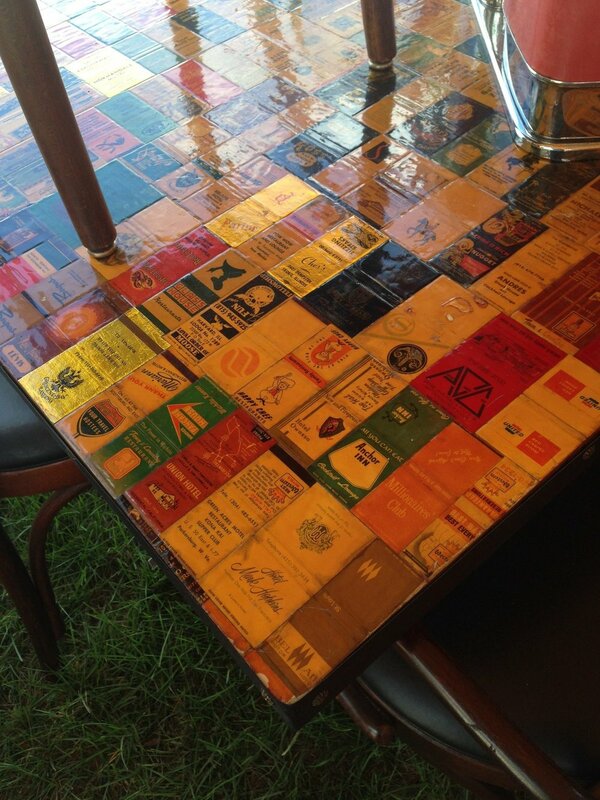 Are we beginning to long for ways to inject a little more PERSONALity into our spaces? 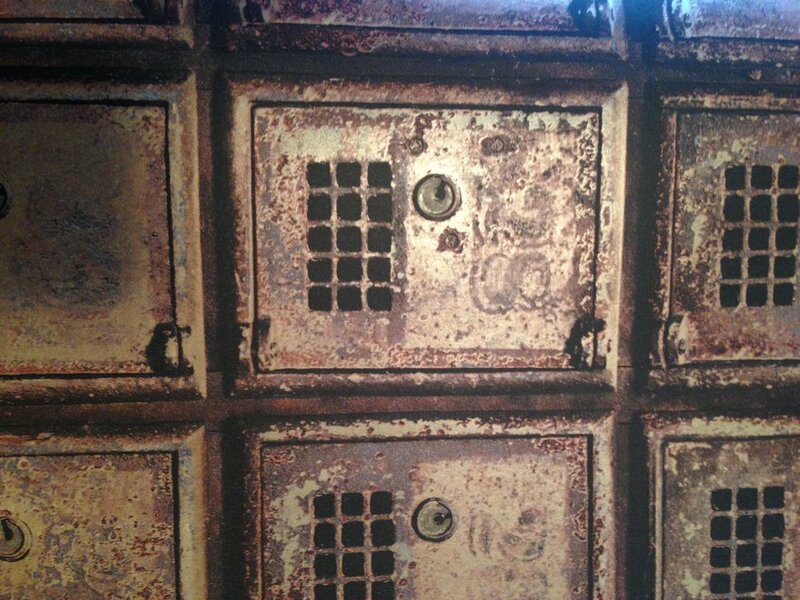 Now, new technology, and a new era have arrived on our doorstep and with it – new wallpaper options. 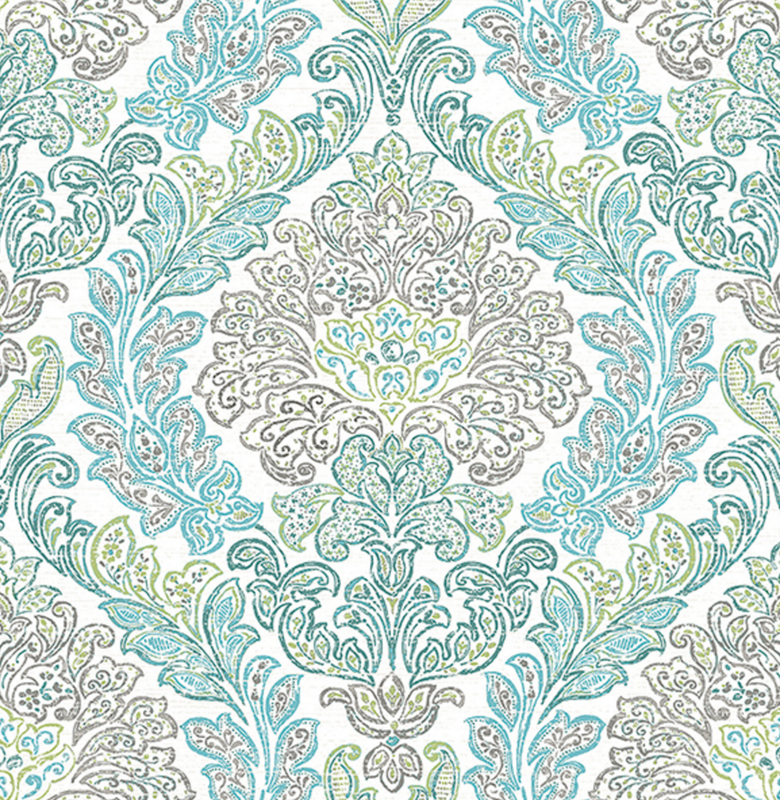 Re-invented archived historic patterns, faux finishes, murals, textures, metallic accents, trompe l’oeil and more. 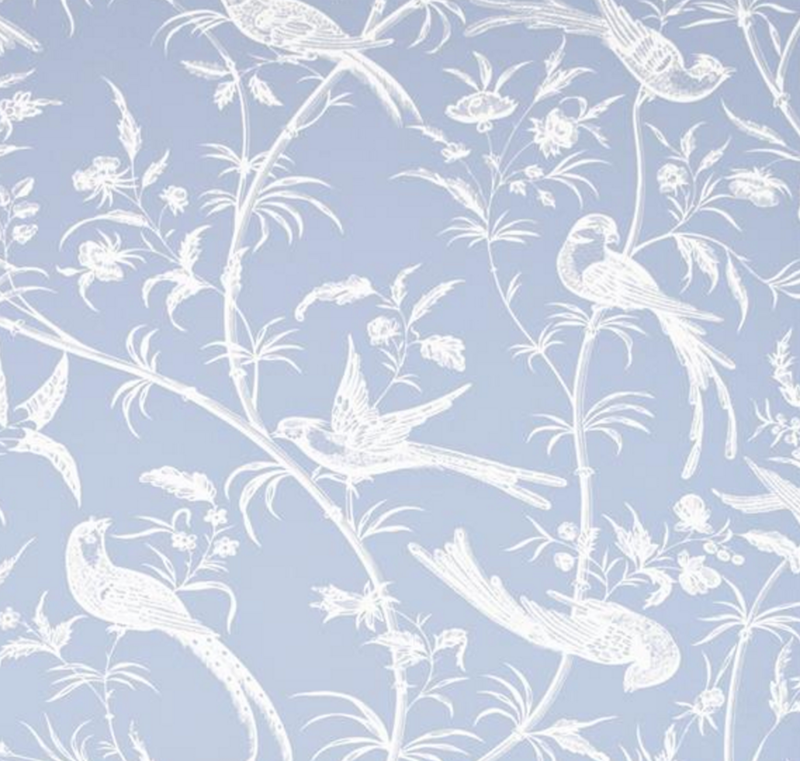 Even if you think you hate wallpaper, the new choices may just surprise you. 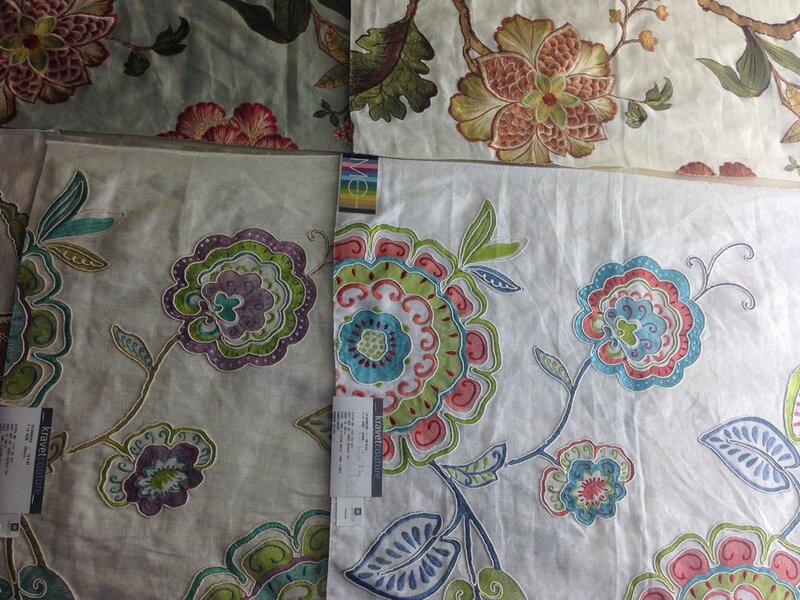 They offer pattern, elegance, warmth, and a variety of textures. a low commitment space since it is small and used only in short intervals. 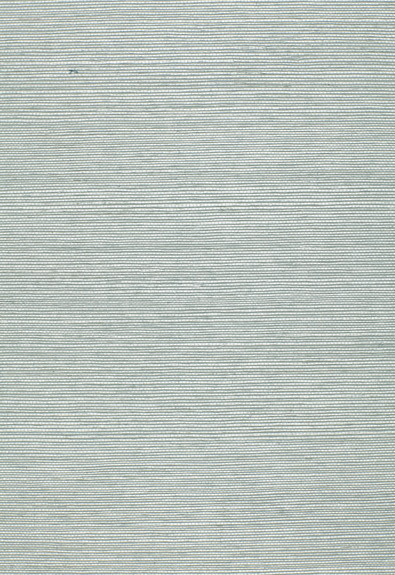 this is especially effective with more modern styles like mid century modern or industrial chic, or with trompe l’oeil papers. 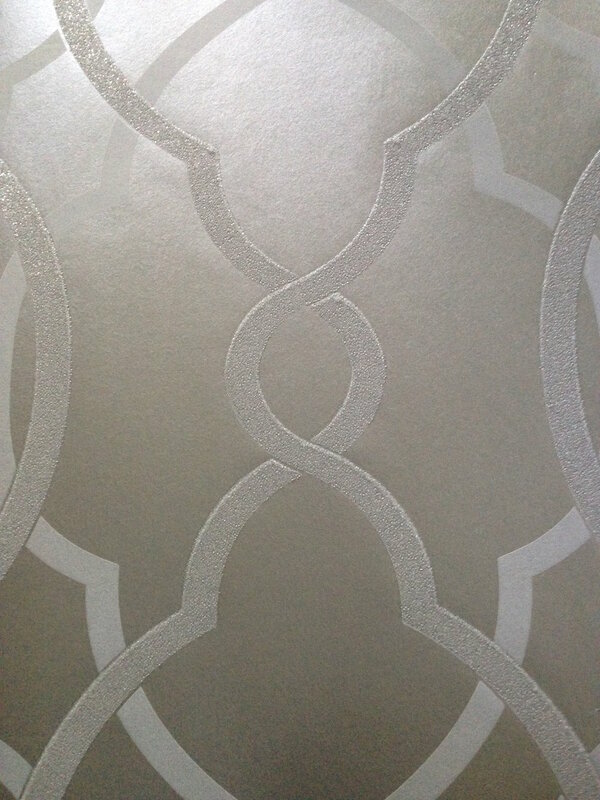 In addition to real wallpaper, there are now temporary wallpapers that just peel off without leaving any mark…a perfect solution for rental property…or really swank dorm rooms...or just for the terminally indecisive! Ready to take the plunge? 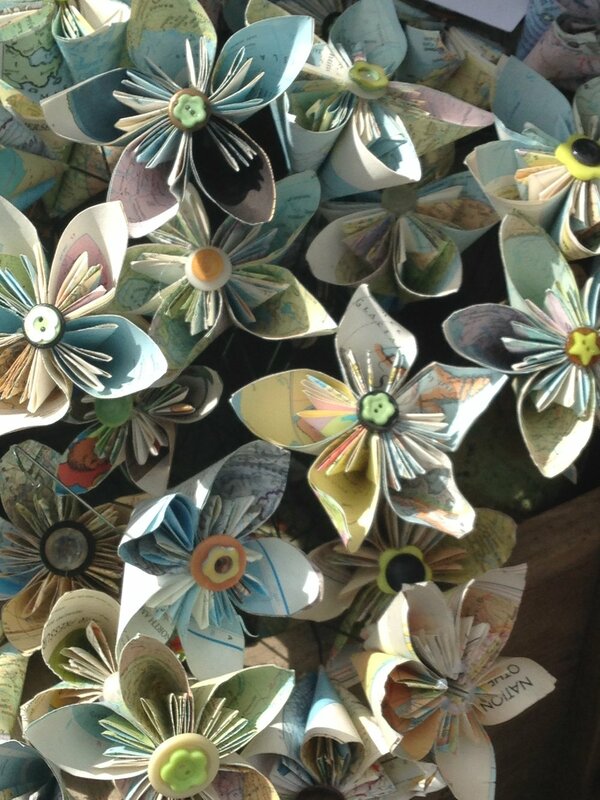 We would love to help you choose a paper that is just right for you! Contact us at JRLInteriors. 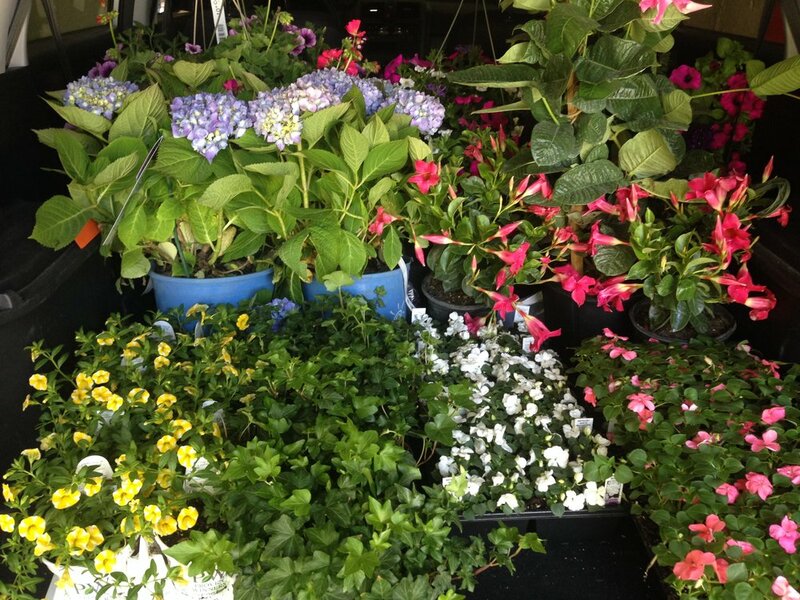 Tis the season ... to plant flowers! I am decidedly NOT a gardener, much to my mother's dismay. She has beautiful gardens and likes nothing better than turning over earth and planting all manner of wild varieties of plants. I, on the other hand, do not dig in dirt unless it is sanitized potting soil in a contained environment like a planter or windowbox where I am sure there will not be anything creeping or crawling or slithering. Nonetheless, the minute the weather turns warm, I can't wait to set up my pots of herbs and flowers on the deck just outside my kitchen door. I love having fresh herbs growing just steps from my stove, and I am delighted to be able to sip my morning mug of tea surrounded by flowers and birdsong and the antics of our many resident chipmunks. 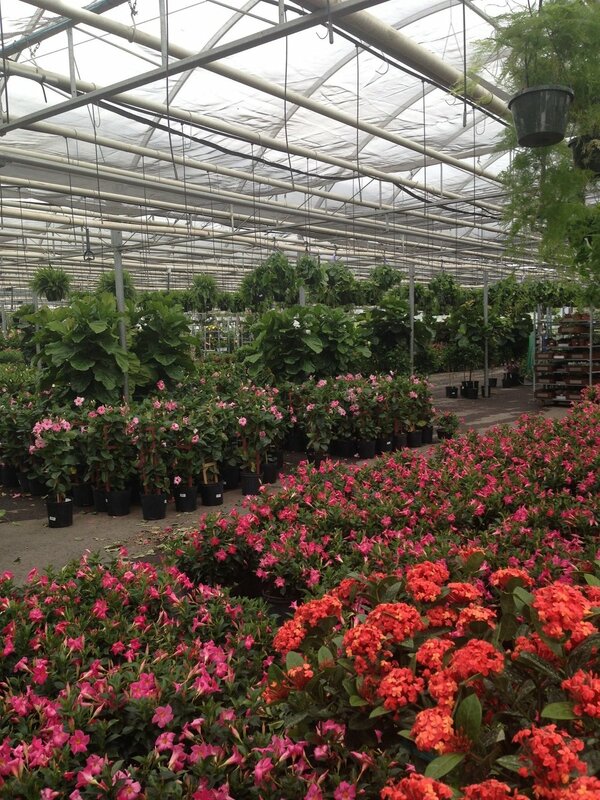 There is nothing like seeing acres of flowers in one place! 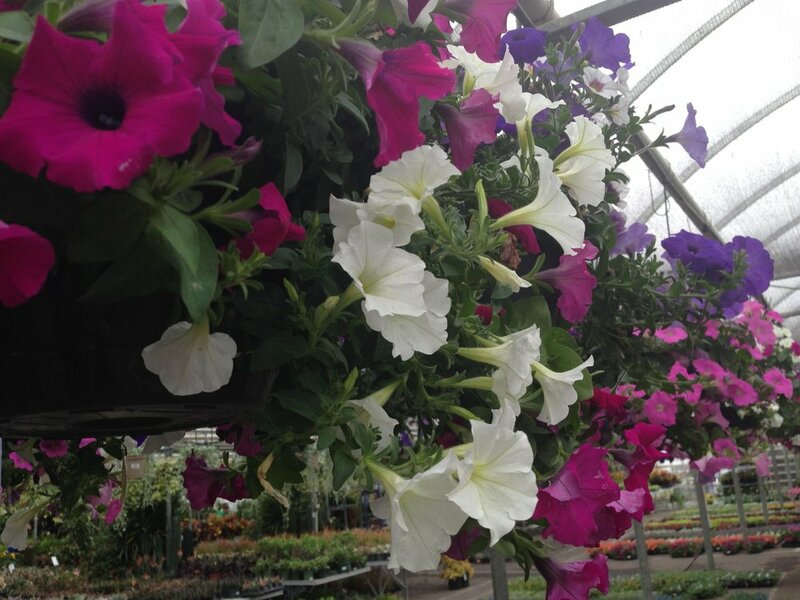 Even ordinary annuals like petunias and impatiens, and geraniums look enticing in such masses. Love these bougainvillea trained into topiary 'trees'. Speaking of tropical plants, no summer patio seems complete without constant bright color from climbing mandevilla vines or the very similar but bushier dipladenia plants. 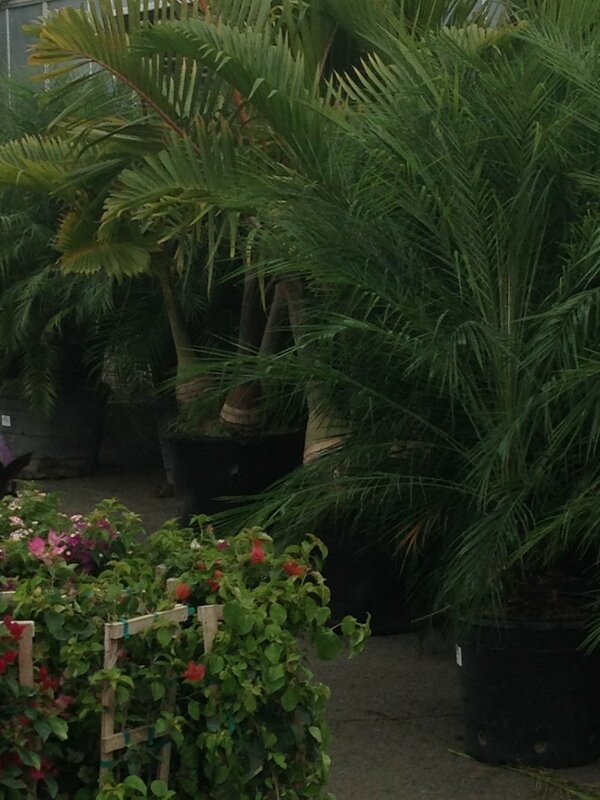 And, of course, palm trees like the ones shown below always add an air of luxury (think Tea at The Palm Court at the Plaza ... ) or at least the fleeting impression that you are somewhere more tropical and exotic than New England! 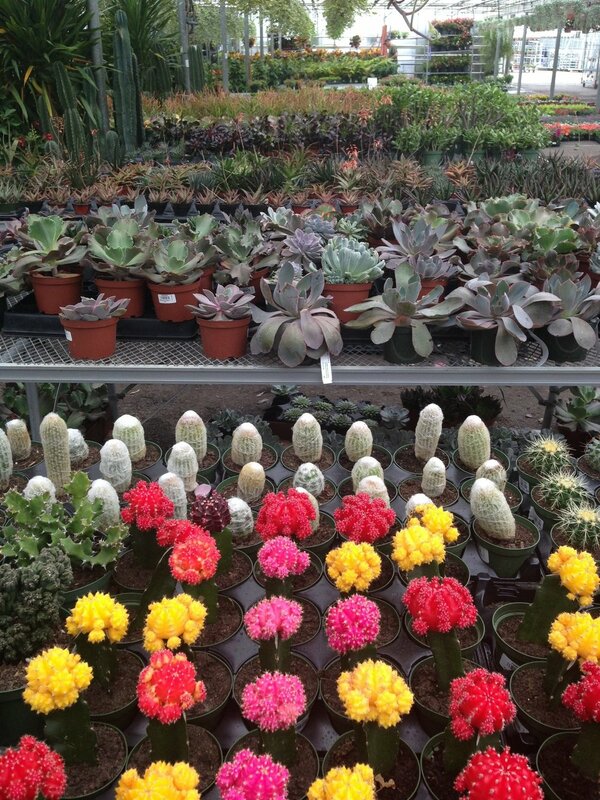 And then there are all these interesting varieties of succulents. I am possibly the only person who has successfully murdered a jade plant ... I managed to overwater it in my zeal to try to keep it alive, which is the one thing that apparently you cannot do to it. More manslaughter (or plantslaughter) than murder, I guess. Hmmm. Anyway, for MOST people, succulents are great because they don't mind a bit of neglect. They are supposed to dry out between waterings. Succulents mixed into a planter or windowbox add great texture and variety. Foliage plants in unusual colors like this Persian Shield in shimmery purple add variety to the garden. My car filled with things I *might* be able to keep alive for the summer! Including these "Endless Summer" hydrangeas underplanted with some white impatiens that may or may not survive and ivy that will eventually cascade over the edges of the urns. These hydrangeas are supposed to bloom all spring and summer long so they seemed perfect for my entryway urns - once the season is over I can plant them in the garden and hope they reappear next spring ... we'll see! 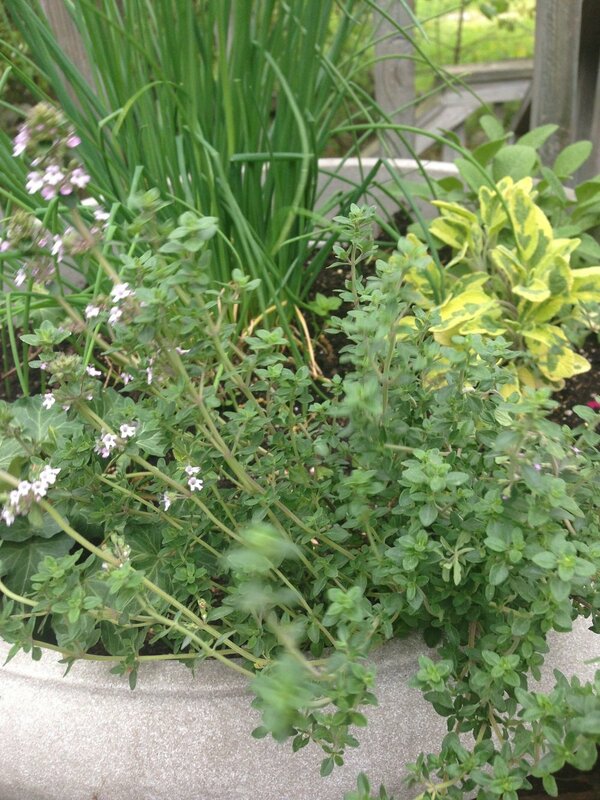 And one of my herb pots with chives that reappear every year (YAY), thyme, and a couple of varieties of sage so far. I am still on the lookout for ever elusive tarragon plants, and I think I will add some mint as well since it enhances so many nice summer beverages. And the other contains huge quantities of basil and a fair amount of rosemary, with these adorable yellow and white striped miniature petunias mixed in for some fun color. 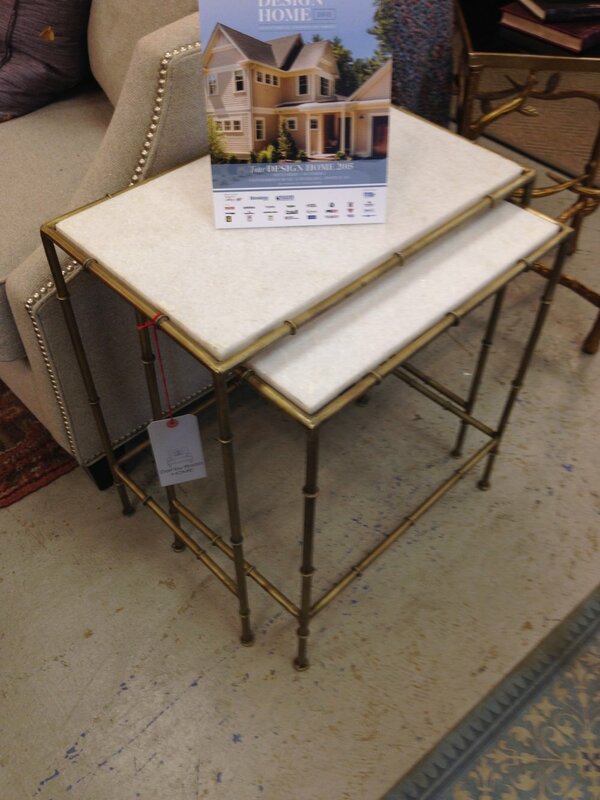 and these patterned metal drink tables. and in metal and stone. 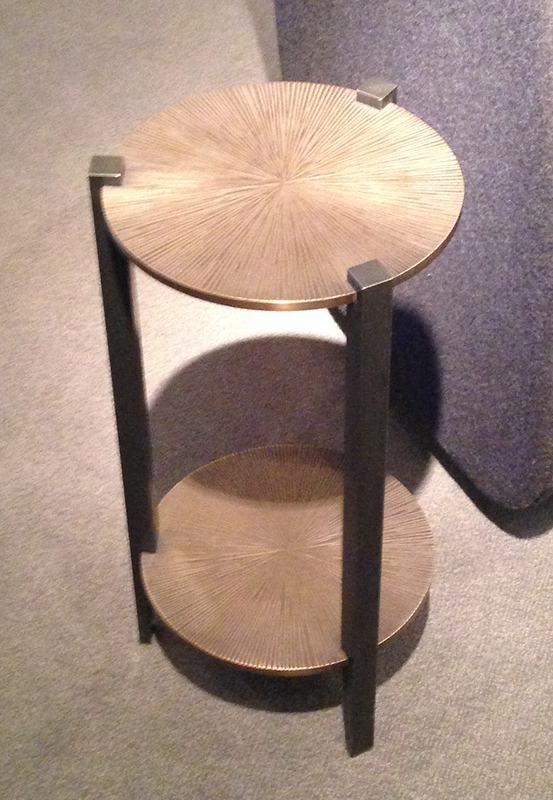 and this chrome base with a removable lacquer tray top. 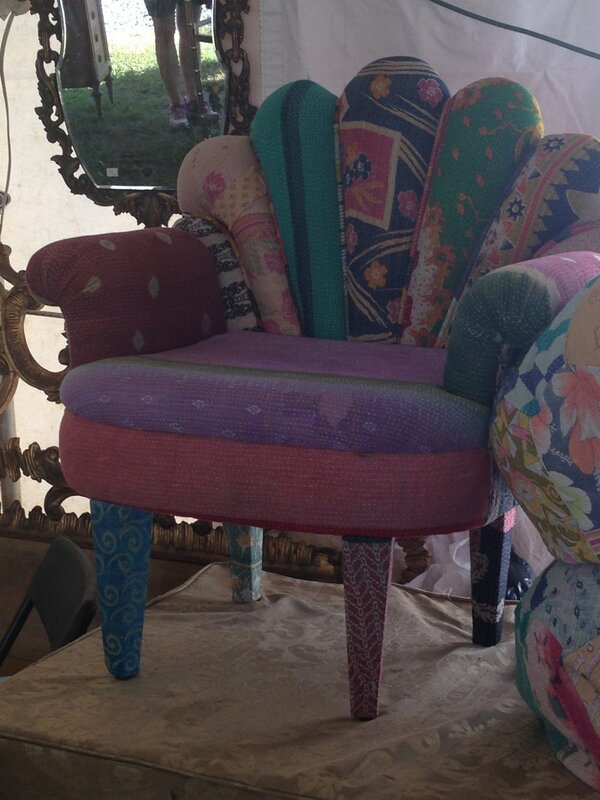 This was a really fun option in a whimsical color and shape. 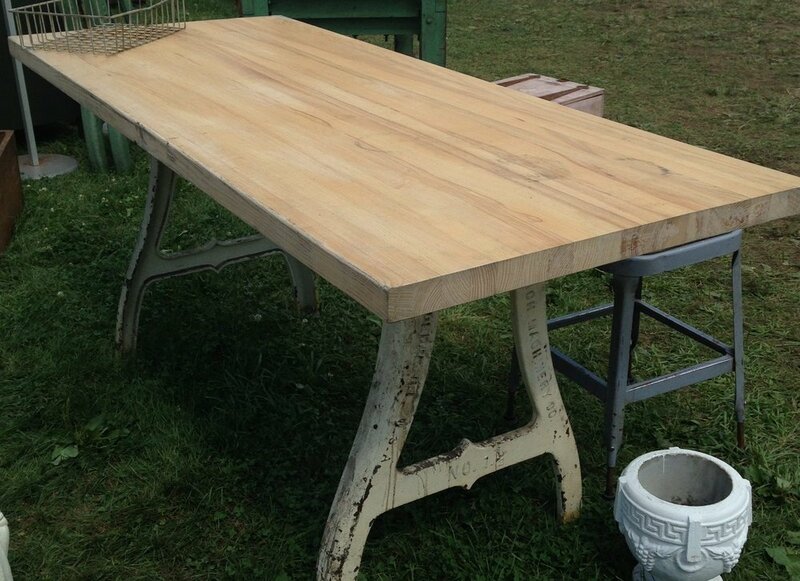 There is a definite trend toward acrylic tables in a variety of styles that would fit seamlessly in almost any room while maintaining a light and open look. 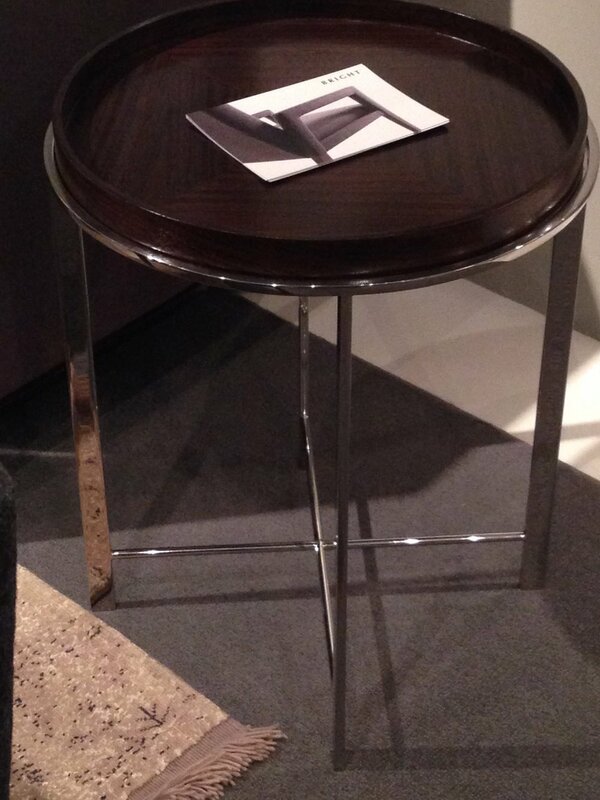 There is a current trend toward pairs of square cocktail tables as a more flexible alternative to a single rectangular one. 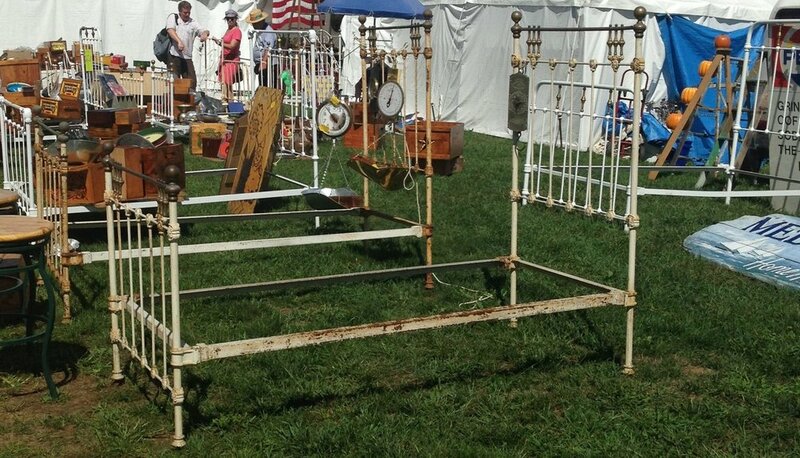 Here are some interesting ones in zinc with gilded iron bases and some glamor-meets-campaign ones with mirrored tops on classic x-frame wood bases. 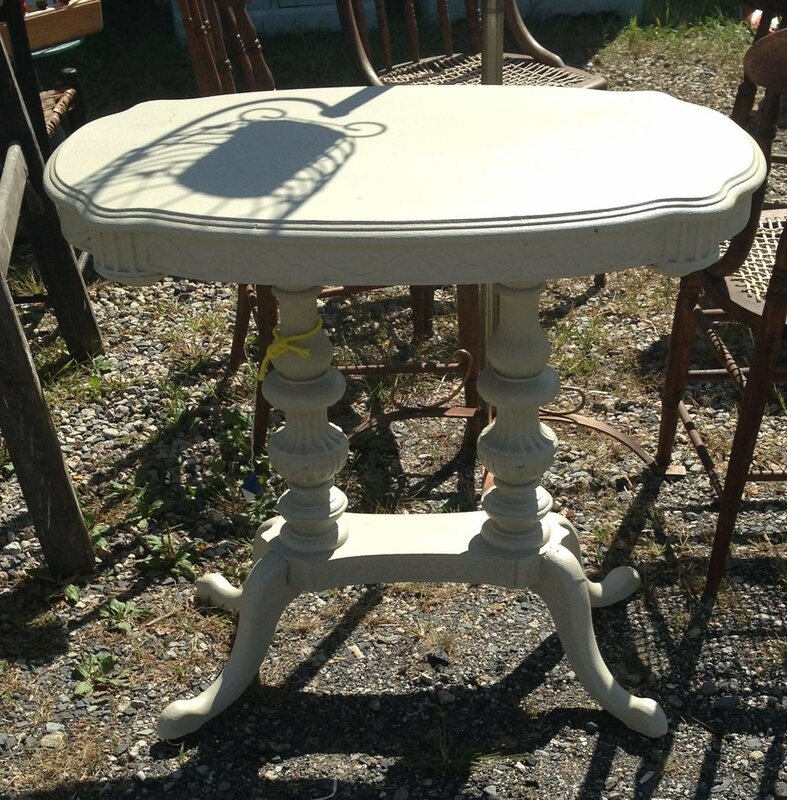 There are still plenty of more classic style cocktail tables, but in newer material mixes such as this round cocktail table with a great antiqued, beveled mirrored top on a distressed, turned-leg base. A recent visit to some of our favorite showrooms had us drooling and dreaming .... Now that we've caught up on that hour we lost this past weekend (seriously, isn't it time to give up this whole 'daylight savings time' thing??) 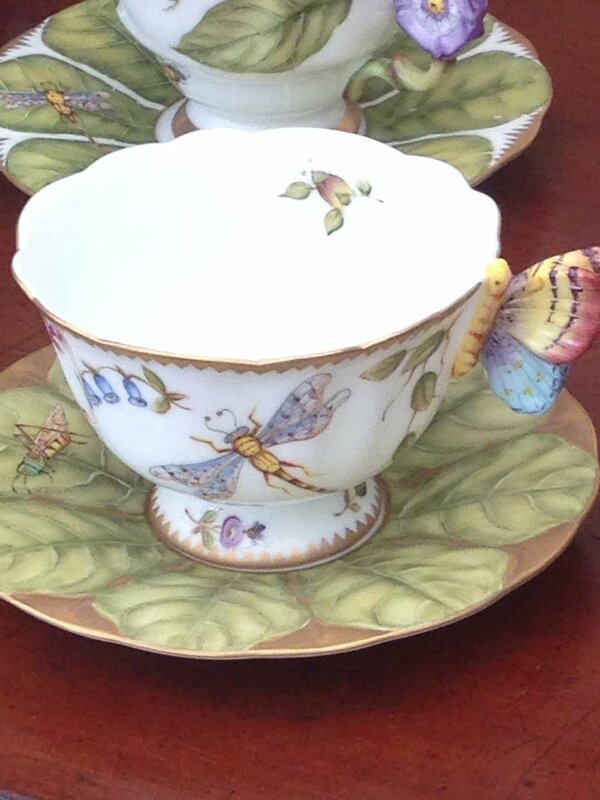 we are reveling in the warmer weather that promises springtime is around the corner. The gardens are starting to wake up and we are beginning to daydream about al fresco dining. What better place to dine than on a patio outfitted with this beautiful, classic, iron and stone set? Or for indoor dining, how about these unusual sleek leather skirted parsons chairs with this great stitch detailing at the side and back pleats? 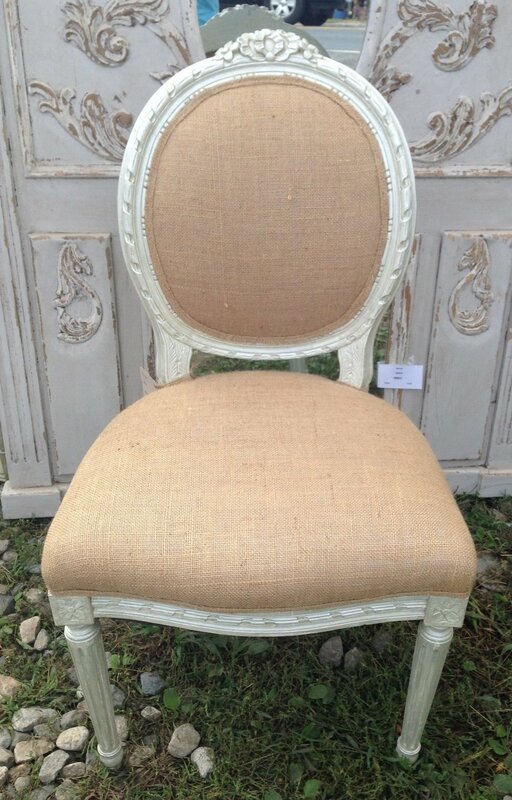 As we've mentioned before, we LOVE detail on the back of a dining chair! This cushy tufted headboard from Century Furniture begs for a good book,and we love the button detail on these pillows and duvet. And these sheets! OH MY! 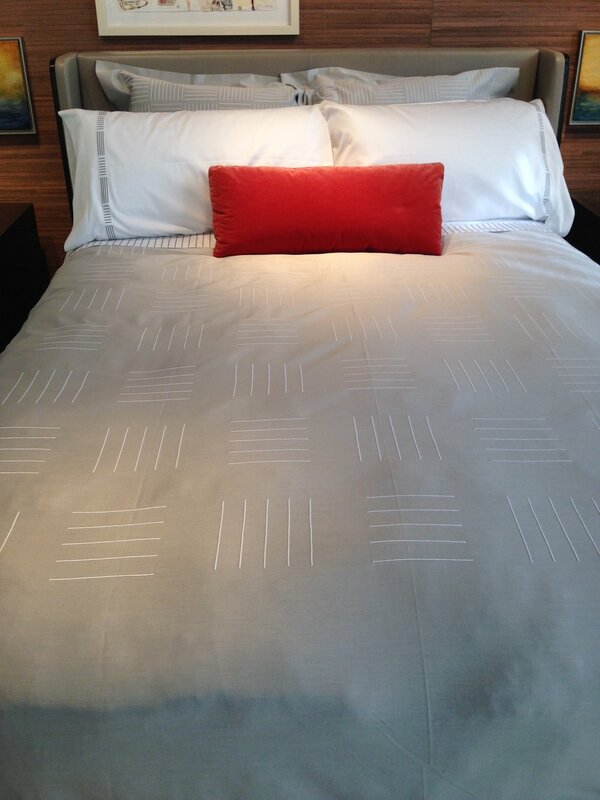 I've never felt or seen anything like this GORGEOUS embroidered bedding from Muse Bespoke - Italian cotton sateen, completely custom and luxurious - hey, you spend a third of your life in bed, right? Shouldn't the bedding be wonderful? And this, from the same line but with a more contemporary vibe.